We design, manufacture and deliver kids outdoor wendy houses, play houses and forts. We also manufacture kids wooden “mini” furniture including stoves, sinks, washing machines…anything for a big house we make for a small house!! We are based in Durban North, Kwazulu Natal and deliver countrywide. 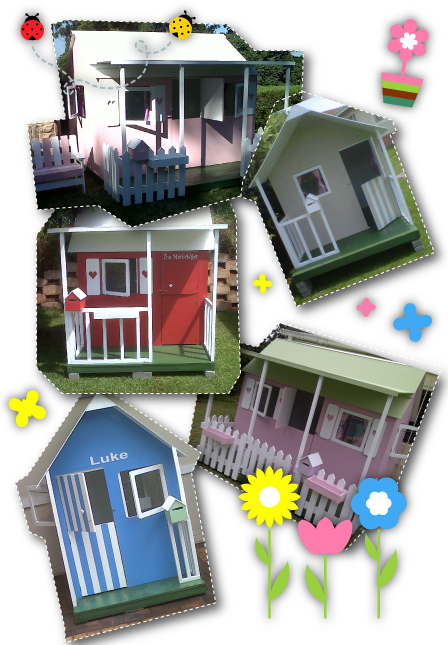 We have sold over 5000 play houses to date, our designs are original and have been developed and designed by us! We do not copy other companies, nor do we sell off sketches. We do not make big huts and then convert them to “mini huts”, our business is playhouses for children! Fun and educational all at once with many fine motor skills being developed as well as imaginative play! We have created the sizes, styles and dimensions of all play houses to suit gardens of all sizes and to not only be an amusement for the kids, but a pleasure to look at too. Furniture 4 Kids offers a variety of wendy house and fort furniture to compliment all of our products and continuosly adds to the overall experience of creating a new and imaginative world outdoors. Our stylish bedroom furniture range compliments any size bedroom and offers themes and designs to suit boys and girls of all ages. Our brand new space saving loft bed is the perfect solution to any small bedroom, with a bed, desk, book shelf and chair all-in-one. Wendies 4 Kids / Furniture 4 Kids are centrally located in Briardene, Durban North, Kwa Zulu Natal where we manufacture all of our products and offer courier countrywide. We offer delivery and installation in KwaZulu Natal & Cape Town. We supply countrywide offering VERY easy to assemble DIY flat pack kits of all of our products and courier them to your door. Courier is included within a 20km radius of all major centres including Johannesburg, Pretoria, Cape Town, East London, Port Elizabeth and Bloemfontein. Outlying area may require a top-up fee. Please contact us for delivery enquiries. We design, manufacture and deliver kids outdoor wendy houses, play houses and forts. We also manufacture kids wooden "mini" furniture including stoves, sinks, washing machines...anything for a big house we make for a small house!! Furniure 4 Kids offers a full kids bedroom furniture range including personalised headboards, tall boys, pedestals, toy boxes etc. We are based in Durban North, Kwazulu Natal and deliver countrywide.